The next morning after kitting up we headed off up the winding path. We soon learned a lot of Swahili on the way up the mountain, as each guide passed us there would be an exchange of lingo and laughter..’Safi kama samaki!’ this one guy said, carrying a huge duffel bag on his neck as he passed us.. translates to ‘smooth like a fish’! On arriving at the first view-point we met up with other South Africans, which was a welcome surprise, although we met a lot of interesting people from all corners of the globe. The walk today took us up to 4200m at Lava Tower, where we lunched and fed the ravens, (they basically took the food out of our bags on the way up). The temperature dropped considerably during the day- I still remember regretting that I had worn shorts as it began snowing for a good hour before I had a chance to look for my rented summit wear. 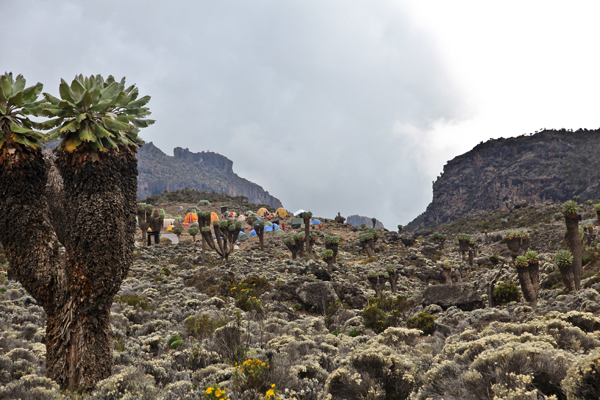 From Lava Tower to Barranco camp was mostly a scramble down the mountain crossing numerous rivers and Giant Groundsel cacti fields- with the tallest, most majestic plants you have ever seen. Truly spectacular. 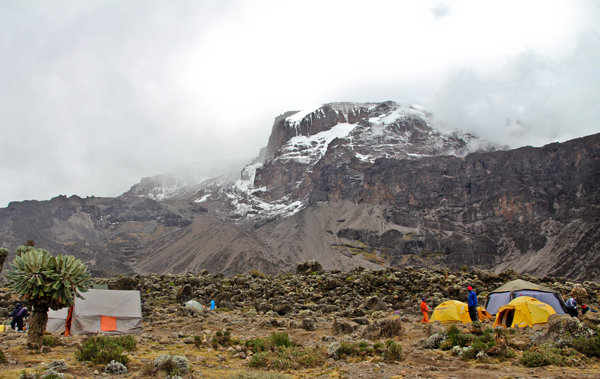 All the way into camp we were awestruck by huge mountain walls surrounding us. We walked along a narrow watershed, 2 gorges on either side, mountain walls beyond that. In the distance, an island of multi-coloured tents, busy villagers roaming about with their daily chores. Myself and Paul were walking right at the back chatting to 2 guides on an insight into Tanzanian life. There was absolute serenity at the camp- by far the most beautiful of sites we were going to stay at. We were back down to an altitude of around 3200m and the acclimatization process was feeling ok. Everyone else were also doing well, as today’s climax was a test and spirits were still high toward the late afternoon. A cricket ball was nonchalantly produced from David’s bag! A ‘bat’, forged from a wooden plank off the side of a public porta-cabin was crafted. Soon there were players and spectators from far and wide across Barranco joining in- at the most beautiful stadium in the world. No points for 6’s though, as the game ended abruptly on a slog over the ravine! Early morning was a treat at the usual sunrise hour. 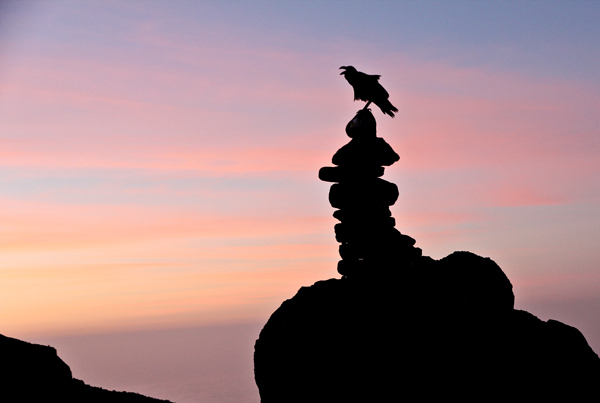 Ravens pecked around at left over food and plastic bags scattered around the sleeping camp. The first rays of light illuminated a veil of low-hung clouds beneath the camp stretching out over all of Tanzania. How special and privileged it felt to be in this wonderland, and what adventures still lay ahead of us? 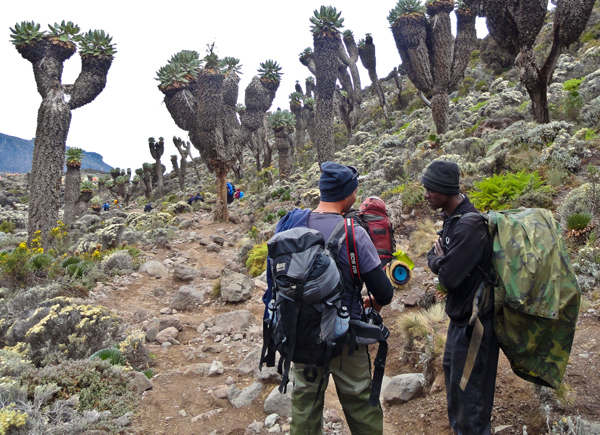 Following breakfast and the usual jokes with the Rasta’s from Cape Town in the adjacent camp, (puffing away at a zol the size of a small baby’s arm) we packed up and in snake formation, wound our way towards Barranco Wall. This wall was the most technical part of the hike, the rest was a slow stroll or ‘pole, pole’ as the locals say in Swahili (‘slowly, slowly’). The wall was a steep cliff face about 100m high and we had to ascend very slowly and carefully (without ropes- it wasn’t that bad), but still quite alarmingly dangerous I might add. Then there she was, the Canadian girl, right behind our group. We had made friends the day before while descending to Barranco (but still didn’t know her name). 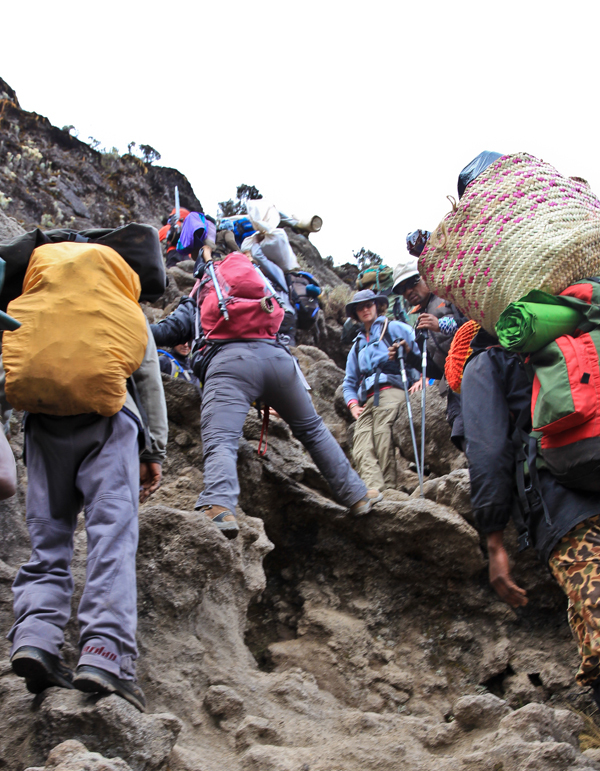 By the time I had reached the apex of Barranco wall (and the rest of the crew had long since let onto this), I had just about heard enough from the ‘manne’. Some two and a half hours later we reached the top and the mist had descended once again. We relaxed for snacks and a pee break. The route then descended and reascended for the rest of the day over ravines and canyons, hills and peaks, winding and climbing. It was really quite a long day. We got to camp drenched from the last hour’s downpour and steep climb back up a ravine into day 4’s camp, Karanga. The altitude was 3600m and my ears were still ringing softly, but the better part of me was doing ok! This camp was definitely not as picturesque. It was a well flattened area from well worn tourist boots and was largely muddy. There was an eerie mist that seemed to continuously wisp around us and roll in from all directions. After cleaning up with our ‘water-for-wash’, most hit the sleeping bags after the 8hr trek. I sat outside with my camera just observing the curious behaviour of the mist. Then suddenly as the sun came out behind me I looked around and to my surprise saw a massive white snow capped peak rising just behind us. The mist that was coming down the mountain opened up to reveal the mighty ascent which lay ahead of us in a couple of days. We played cards till night-fall, had an early dinner and turned in. The next morning after bumming some smokes from a porter- as I heard that smoking aids with the acclimatising process (I might have been delusional and suffering AMS without knowing it) we departed once again. Today was a short 4 hr walk to base camp. The walk was now completely devoid of vegetation and resembled a dead moonscape. Shards of cooled down volcanic rock in the form of slate was strewn everywhere, it was really quite eerie. We had a geologist on board with us and Reinet kept us well informed of the processing of eruption and re-eruptions occurring millions of years ago. (Thanks Reinet, it was really interesting! ).